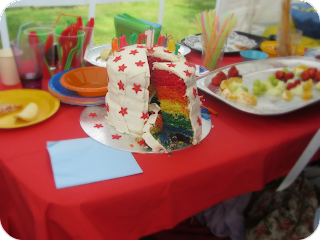 Oooh, rainbow cake. How did you do that? Brilliant, it worked!! Those gel colours are so much brighter aren't they. Looks fabulous. Did you get an amazed reaction when you cut it? That is a VERY cool cake - I want one!! Hey - It worked. It looks fab. The colours are really bright. I must give it a try. Oh I so want to nom some of that amazing cake! Lovely - that cake looks delicious, and so pretty! That is entirely amazing, and looks delicious! I need to know how you did this! My blue cakes turned out green and my red cakes were a horrid brown colour! This looks fab! The key is paste food colourings rather than gel. They are amazing! Looks like a good party and an awesome cake!